Let’s be honest: college life is a life full of extremes. From the the excitement and nerves surrounding your first day, to the stress of handling coursework and hitting deadlines, and preparing meals and staying healthy can be difficult. With many college students living with restricted resources (let’s face it–cooking in a dorm is virtually impossible) and watching their budgets, we’ve compiled a few quick back-to-college snacks for surviving this semester. Yes, we’ve all been there: rushing out of the door with one shoe on, late to an 8 am class, stuffing our face with a pre-packed snack filled with processed sugar for a poor excuse of a breakfast. It’s important to keep healthy, quick breakfast options on hand for these hectic early mornings. One great option is instant oatmeal with some fresh fruit tossed in. Our favorite? Pineapple of course! Fresh pineapples are much more affordable and flavorful than canned options, not to mention much healthier! Check out the short video below for a quick tutorial on how to slice and dice your own fresh pineapple. Not only are fresh fruit smoothies delicious and healthy, they’re a perfect breakfast or snack for on-the-go. With fresh fruit on hand, you can create all sorts of delectable combinations without breaking the bank. Not only are smoothies a breakfast option that are easy on your wallet, superfruits like pineapple can help boost your immune system and keep you feeling great all semester long. Our pineapples are packed with Vitamin C and bromelain, making for an immunity-boosting kick. High concentrations of Vitamin C improves and strengthens the immune system, combating those nasty germs bound to fill your school’s facilities. This combined with brolemain’s ability to work as an anti-inflammatory is extremely beneficial for fighting infections and eliminating bacteria. Check out some more pineapple health benefits to kick off your semester right here. 3) Don’t Forget About the Protein! When rushing around from class to class, it can be easy to pick up carb-filled snacks that aren’t providing you with much protein or long-lasting energy to make it through your day. Snacks like cottage cheese topped with fresh fruit are a great way to get some protein in your diet, while satisfying those sweet and savory cravings. Chopped pineapple is a classic topper for this creamy comfort dish. Not to mention, this snack is very affordable! Late night study sessions and early morning classes may leave you feeling tempted to grab for a sugar-filled soda for an extra energy boost. While these beverages may provide a temporary fix, sodas are notorious for creating a laundry-list of health risks for consumers. These risks include: increased risk for diabetes, decreased kidney function, changes in metabolism and more. On top of all these serious health risks, drinking soda actually dehydrates you. Whipping together a refreshing batch of fresh pineapple lemonade with keep you feeling refreshed and hydrated, all while saving you money on the cost of overpriced sodas. Check out the three-ingredient recipe here! 5) A Sweet Treat is Okay..But DIY is Better! Between a new course load, new professors, and new peers each semester, it’s no secret that college is one of the most stressful times of our lives. Stress can leave us turning to sweet snacks and candies for comfort, but these treats don’t have to be unhealthy. Homemade popsicles filled with fresh fruit are a healthier alternative to that cookie-filled ice cream that you may start craving during that all night study session, and are so easy to make! 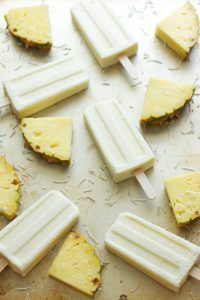 Check out one of our favorite combinations with this Pineapple Coconut Yogurt Pop Recipe. This entry was posted in Featured, Latest News, Recipes, Tips & Tall Tales and tagged chestnut hill farms, college, healthy, healthy recipes, pineapple. Bookmark the permalink.